2018 was not my most prolific year in terms of video output, but it provided, nonetheless, some interesting and useful insights into the struggle for peace and human rights in various parts of the world. Here is a rundown of the past 12 months and as we like to say in YouTubeLand, if you enjoy any of these, please click the “like” icon and subscribe. Steve Ellner: What is really happening in Venezuela: The Winnipeg Venezuela Peace Committee held a public forum on Friday, Oct. 19, 2018 entitled “What is really happening in Venezuela?” The forum featured Steve Ellner, professor of economics at the University of Oriente in Puerto La Cruz, Venezuela. Watch. Yves Engler on Canada’s Left & its Foreign Policy Failures: Yves Engler discusses his latest book, “Left, Right — Marching to the Beat of Imperial Canada.” The book details the failure of Canada’s Left parties, institutions and intellectuals to confront Canada’s support of empire and promotion of corporate interests abroad. Watch. Niranjan Takle: Journalism under Hindutav Fascist India: Indian journalist Niranjan Takle recounts how the mainstream media in India ignored or refused to publish his report on the suspicious death of Judge Brijgopal Harkishan Loya. Watch. Israel Palestine International Law Symposium: An impressive line-up of experts on human rights and international law gathered in Winnipeg for a weekend to explore various legal aspects of the Israel-Palestine situation. I recorded all of the sessions. Introduction: Symposium coordinator David Kattenburg explains the origins and purpose of the symposium. Human rights: Rhetoric vs Reality: Lawyer and journalist Dimitri Lascaris describes the failure of western governments to uphold the human rights of Palestinians. Keynote Address: Michael Lynk, who is the United Nations Rapporteur on the situation of human rights in the Occupied Palestinian Territory, explains how international law has largely been ignored or broken by Israel over the past several decades of its occupation of the Palestinian Territory. Israeli Rights and Obligations: Michael Lynk and Dimitri Lascaris explore different aspects of Israeli’s legal rights and obligations in the Occupied Palestinian Territory. One State or Two? : Professors Michael Lynk and Virginia Tilley speak to this issue. Palestinian Rights & Obligations: In this clip, we hear from human rights advocates Suha Jarrar and Jonathan Kuttab. Palestinian Rights to Resources: Suha Jarrar, a Palestinian human rights researcher and advocate, and currently the Environmental and Gender Policy Researcher at Al-Haq human rights organization in Ramallah, Palestine explains how Israeli companies illegally exploit resources in the Occupied Territories. Is Israel an Apartheid State? : In this clip, Virginia Tilley argues that Israel meets the legal definition of an apartheid state. Dueling Perspectives: In this clip, David Matas defends Israeli practices and policies with regard to the Occupied Palestinian Territories (OPT). Michael Lynk argues that Matas’s arguments are not supported by international law. Canada’s Rights and Obligations: Dimitri Lascaris explains how Canada has not lived up to its obligations under international law. Concluding Remarks: In this final clip from the symposium, we hear from David Kattenburg, Mark Golden and Dean Peachey, key organizers of the event. The symposium was sponsored by (alphabetical order): Independent Jewish Voices Canada, Mennonite Church Manitoba Working Group on Palestine-Israel, Palestinian Canadian Congress, Peace Alliance Winnipeg, United Jewish People’s Order (Winnipeg) and the Winnipeg Centre Federal Green Party Association. Additional information, including Power Point presentations and other documents will be made available at the conference web site. Winnipeg Lanterns for Peace 2018: Every August, Winnipeggers commemorate the 1945 atomic bombings of Hiroshima (Aug. 6) and Nagasaki (Aug. 9) with a Lantern Ceremony in Memorial Park. We believe it is important to keep the memory of those horrible events alive so that current generations understand we must never allow nuclear weapons to be used again. Watch. St. Boniface By-election 2018 – Elizabeth May and Françoise Therrien Vrignon: Françoise Therrien Vrignon was the Green Party of Manitoba candidate in the July 17th Manitoba by-election in St. Boniface. With her in this video is Green Party of Canada leader Elizabeth May. Their discussion took place at La Maison des artistes visuels. Watch. Winnipeg Rally for Refuge: The Canadians Care Coalition in association with Amnesty International, Menno Simons Students Association and the Global College Students Association held a rally entitled “Rally for Refuge: Rescind the safe third country agreement.” The coalition demanded that the Canadian Government rescind the designation of ‘Safe Third Country’ that is applied to the United States because the US is demonstrably unsafe for refugees. The Safe Third Country Agreement denies refugee claimants access to the Canadian refugee determination system if they have come from the United States to the Canadian border. Watch. Winnipeg Walk for Peace 2018: Winnipeggers held their 37th Annual Winnipeg Walk for Peace. Sponsors: Peace Alliance Winnipeg and the Winnipeg chapter of the Council of Canadians. Watch. Michel Chossudovsky – The Globalization of War: The Regina Peace Council played host to Professor Michel Chossudovsky, who spoke on the growing dangers of world war and the need to revitalize the peace movement. Professor Chossudovsky is the founder and director of Global Research. Watch. Al Nakba 70 in Winnipeg: Winnipeggers marked the 70th anniversary of the forcible expulsion of Palestinians from their land and expressed solidarity with the people of Gaza who are under Israeli siege. Watch. Make Poverty History in Winnipeg: Make Poverty History Manitoba released a comprehensive report on the poverty that affects one in ten Winnipeggers and called on the city’s mayor, Brian Bowman, to take the lead in developing a poverty reduction strategy for the city. Watch. MFL Day of Mourning 2018: Manitoba’s labour movement held its annual observance in memory of injured and killed workers. Hundreds attended the march from the Union Centre to Memorial Park and the future site of the Firefighters, Peace Officers and Workers Memorial. Watch. 7th Generation Walk for Mother Earth 2018: Winnipeggers marked 15 years of taking to the streets with grassroots land and water defenders.The 7th Generation Walk is alternative to Earth Day, recognizing the resistance and resilience of Indigenous community led campaigns for social and environmental justice. Watch. Mobilize against the war: Just hours before the United States launched missile attacks on Damascus and Homs, peace activists rallied outside the building housing the US Consulate to speak out against the war and Trump’s declared plan to expand it. The picket was organized by the Manitoba Peace Council. Watch. Democracy and Elections in Cuba: Two Cuban government representatives visited Winnipeg to discuss Cuba’s electoral system and other issues of interest. The forum was sponsored by the Manitoba-Cuba Solidarity Committee. Watch. My Jerusalem – Responding to the U.S. Embassy Announcement: Panelists representing Judaism, Christianity and Islam, share their personal reflections on what Jerusalem means to them and the implications of the US announcement to move it’s embassy there. Watch. Winnipeg Commemorates Quebec Mosque Massacre: Winnipeggers gathered at the Manitoba Legislature to honour the victims of the terrorist attack on the Centre Culturel Islamique de Québec. Watch. Winnipeg Kurdish Solidarity: In Winnipeg, the Kurdish community rallied at the Canadian Museum for Human Rights in defense of Kurds under Turkish attack in Afrin, Syria. Watch. North Korea and The United States at a Dangerous Nuclear Crossroads: Michel Chossudovsky is professor emeritus at the University of Ottawa and founder of the Centre for Research on Globalization. He spoke at the University of Manitoba on the history of the United States’ conflict with North Korea and the prospects for nuclear war. Watch. As well, he spoke at the University of Winnipeg. Watch. Arnold August – Cuba-US Relations from Obama to Trump: On a national tour to promote his book “Cuba-US Relations: Obama and Beyond,” Arnold August spoke at McNally Robinson Books on developments in the two countries relations since the election of Donald Trump. Watch. That’s it for 2018. Happy New Year, all! Mainstream media and government sources in Canada and the United States have provided an extremely unbalanced picture of Venezuela, portraying it as a dictatorship when in fact the governing party has won re-election consistently over the past (almost) 20 years in contests deemed fair and democratic by international observers. Through crippling economic sanctions, financial support to anti-government forces, and public musings about the desirability of regime change, the US government has made it clear it wants to put a more reliable puppet in power in Venezuela. With its long history of overthrowing governments it cannot control, the US destabilization campaign is par for the course. As is usually the case, the Canadian government has been an enthusiastic partner. Doing its part to address the one-sidedness of this situation, the Winnipeg Venezuela Peace Committee held a very well attended public forum on Oct. 19, 2018 entitled What is really happening in Venezuela? The forum featured Steve Ellner, professor of economics at the University of Oriente in Puerto La Cruz, Venezuela and Carlos Ron, Venezuelas Vice Minister for Foreign Affairs, responsible for North America, who participated via Skype. Regrettably, the Skype connection was so poor that Ron’s presentation was largely incoherent. While I recorded the entire event, I have not included the Skype portion because of terrible audio quality. On a more positive note, Professor Ellner provided a detailed, highly informative description of conditions in Venezuela and an accessible analysis of how the country arrived at the state it is in. He is more than qualified to talk about this country. Ellner earned his Ph.D. in Latin American history at the University of New Mexico in 1980. Since 1977 he has taught economic history and political science at the Universidad de Oriente in Puerto La Cruz, Venezuela and for ten years taught in the graduate school of law and political science of the Universidad Central de Venezuela. He has been a visiting professor at numerous schools in the United States and Latin America. As Professor Ellner underlined, more than once, the problems faced by the Venezuelan people are complex and challenging; the situation is complicated and difficult to understand without considering many factors. Opposition to the Chavistas by the Venezuelan oligarchs and their foreign backers began as soon as Hugo Chavez was elected in 1999. By fomenting coup attempts, violence and economic instability, these forces have undermined Chavista attempts to alleviate widespread poverty and have magnified the suffering of the Venezuelan people. Not everyone in the audience would agree with the last paragraph; some were very critical of the Maduro government. Nonetheless, the discussion was wide ranging, open to all perspectives, respectful and civil. Here is my video report. According to a January 23, 2018 story from Reuters, Turkey has killed at least 260 Syrian Kurdish fighters and Islamic State militants in its four-day-old offensive into the Kurdish-dominated Afrin region of northwest Syria. The target of Turkey’s attack is the Kurdish People’s Protection Units, also known as the YPG, who are based in Afrin, though the offensive is expected to widen in the days ahead. Because the YPG has been armed by the United States to repel attacks by ISIS, one might wonder why Turkey, also an ally of the United States, would attack them. To make a long story short, and possibly to over-simplify it, the Turkish government views the Kurds as enemies because of an almost century long bid by Kurds in the region for a national homeland. In Winnipeg, the local Kurdish community rallied today at the Canadian Museum for Human Rights. Many are recent immigrants and they fear for the lives of family and friends in the path of the Turkish offensive. When it comes to Venezuela, the mainstream media is awash with lies and distortions and the Canadian government is complicit (with the United States) in an attempt to force the overthrow of the democratically elected government of Nicolás Maduro. One can easily imagine Trump and Trudeau agreeing that it would be a crime to leave the largest proven oil reserves in the world (about 297 billion barrels) under the control of a socialist government pledged to use this wealth on behalf of some of the poorest people in the world. The government of Canada seeks to promote foreign intervention in the internal affairs of Venezuela. We, the undersigned, residents of Canada, call upon the Government of Canada to immediately lift all sanctions against Venezuela, Venezuelan officials, and other individuals, retract all statements in support of US sanctions against Venezuela, immediately cease its support for the efforts of the US and other right wing governments in the Organization of American States (OAS) that violate the sovereignty and self-determination of another member-state and immediately cease all intervention against Venezuela. The VPC is asking Canadians and friends of Canada to sign the petition. Just sign here. The petition arose out of a resolution approved by the attendees of a conference held at the University of Manitoba to mark the 100th anniversary of the Russian Revolution. One of the keynote speakers at the conference was Julia Buxton, an internationally recognized expert on Venezuela. I recorded her talk. Most recently, the VPC arranged for the visit of Professor Johnny Márquez to speak in Winnipeg. Professor Márquez is a Venezuelan lawyer, diplomat and scholar and president of the Latin American and Caribbean Center for Energy and Environment Studies. His first appearance was at the University of Manitoba on Dec. 5, 2017, where he discussed the history of Venezuela’s oil industry and its strategic importance. The following day he presented at Winnipeg’s historic Ukrainian Labour Temple on the current political situation in Venezuela. Both of these videos are linked below. Francisca Linconao is a healer and a spiritual leader of the Mapuche, the largest of the indigenous peoples of Chile. On March 30, 2016 she was arrested along with ten others in connection with the killing of an elderly couple that had occurred January 4, 2013 in the midst of a demonstration on the couple’s farm. Those arrested were charged with murder, arson and terrorism and detained under Chile’s draconian Counter-Terrorist Act. The only evidence linking the eleven accused to the killings was the testimony of one Jose Peralino (above, centre), who claimed he had participated in the attack and knew everyone involved. Peralino has since recanted, alleging police torture and coercion. His allegations are reportedly under investigation, but the eleven accused remain in custody, either in prison or – as is the case with Linconao, under house arrest. The eleven maintain their innocence and are demanding a trial in order to prove it. Supporters have launched an international solidarity campaign and organizations such as Amnesty International have spoken out in their defence. On June 24, 2017, Winnipeg supporters of Francisca Linconao held an evening of Solidarity at Broadway Disciples United Church. Here are some of the highlights. 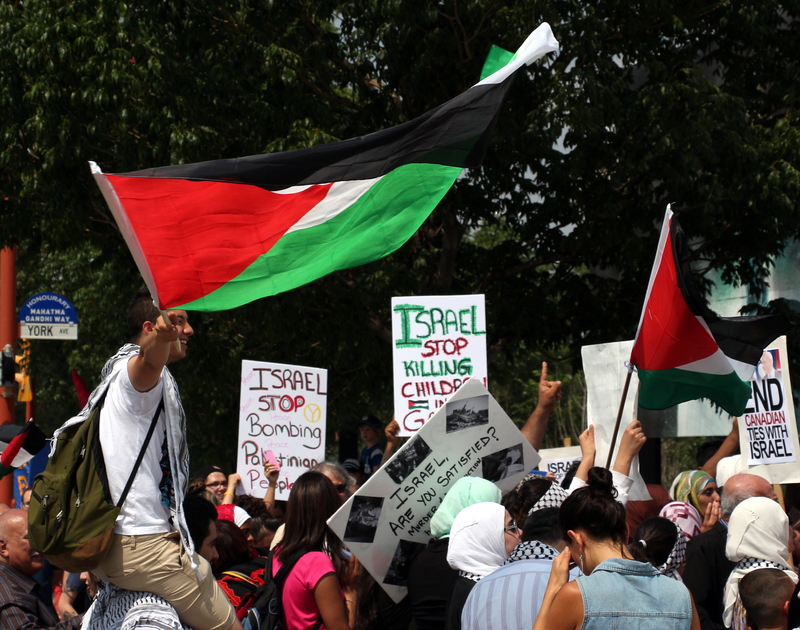 July 19, 2014: Several hundred Winnipeggers rallied in front of the Canadian Human Rights Museum in solidarity with the people of Gaza who are enduring yet another murderous invasion by Israeli forces. The rally, the second in a week, was part of an international day of action. 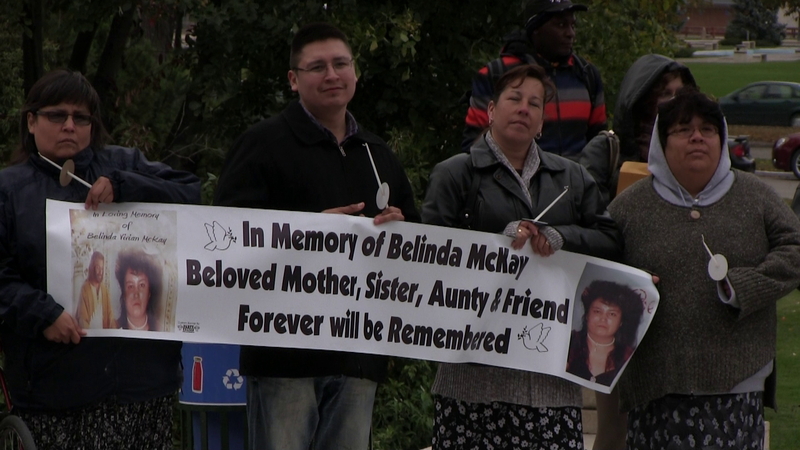 Winnipeggers gathered at the Manitoba Legislature on Friday afternoon to demand an national inquiry into the causes for the disappearance or death of over 600 indigenous women in Canada in recent years. The demonstrators repeated a longstanding demand for a for national inquiry, something that has gained the support of all provincial premiers and territorial leaders, but which continues to be rejected by the federal government. Appearing in this video report are Rosanna Deerchild, Chief Francine Meeches, Judy Wasylycia-Leis, Raven Hart-Bellecourt, Robert Animikii Horton, Jo Redsky, Sierra Noble, Dana Foster and Chief Cathy Merrick.